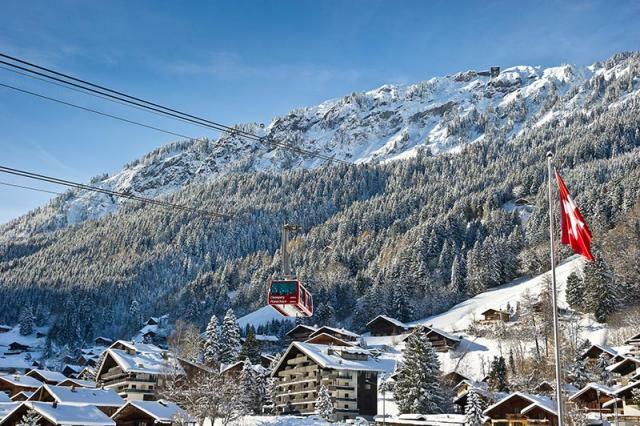 Les Portes du Soleil ski area is one of the terrific places for ski-safari goers. It is located on the border of the Haute-Savoie and the Swiss Alps. This ski region is meant to be the most interesting in Europe, because it encompasses 2 countries (France and Switzerland), 12 ski resorts and more than 650 km of ski pistes. Les Portes du Soleil ski region unites 8 French and 4 Swiss resorts. One of the numerous advantages of this ski region – abundance of protected places. We can call one drawback – modest altitudes. But it’s not an obstacle for skiers from other countries. – Eric, could you tell us a little about Le Portes du Soleil ski area’s location and its history? The largest ski area in the world – Portes du Soleil or «Gates of the Sun» got its name from the local mountain passes on the Franco-Swiss border. International ski area is conveniently located between les Crosets and the highest local of the valley of Morgins. In 1974 there were built all major links between the resorts in the region, which allowed to introduce a single ski pass for skiers. From this time on this immense territory in winter skiing enjoyed by thousands of skiers and in summer to change them come the tourists, mountain cyclists, hang-gliders and horsemen. In fact, the tourist revenue of a vast ensemble of French and Swiss resorts is sold under one label only «LE PORTES DU SOLEIL». – What are the main characteristics of skiing at this ski area? There are 12 international resorts offer total of 296 slopes connected with 194 mountain lifts. – Are there any special offers for ski-pass purchase? There is only 1 pass for the international area of the Portes du Soleil. You can buy it at 49.50 € for a day. The season lasts from December till April. – Are there any facilities for snowboarders, freeriders? Yes, there are many areas for freeride skiing. And, of course, not to mention the legendary track Mur Suisse «Swiss Wall» – a few hundred meters thick hillock on the Eastern slope. Many skiers completely exhausted get to the end of the path, but it's an unforgettable feeling – «survive» here. There are also 13 snowparks in the area. – Suppose, you have something to teach children and adults? There are four ski schools in ChampÉry and they all offer private lessons for all levels and all ages in skiing, snowboarding and telemark, for all levels of training and for all ages. – The ski area is quite big, so, does it mainly offer hotel, residence and/or chalet accommodation and how large and modern they are? You can find all kinds of housing in the area. A campsite surrounded by greenery, guest rooms full of charm, holiday apartments for the whole family, traditional hospitality and for all budgets. Our specialty of the house, which had for a long time pleasing to motorists, is considered the proposal of the campsites. There you can find the charming guest rooms, a convenient apartment for a family vacation, max of modern facilities and all this surrounded by our beautiful nature. Resorts can offer a range of modern accommodation facilities, which are all renovated and 2 new 4 stars hotels will open for the coming winter 2015-2016. – What are the most popular? Each year, Switzerland Tourism, assigns PRIX BIENVENU to hotels that perpetuate best tradition of Swiss hospitality. The first place was awarded at the Hotel Beau-SÉjour that charms its guests for its personal service and individual and friendly Alpine style. – From which countries do your guests usually come from and what social and sport events can the resort offer? They come from everywhere in Europe. Rock the Pistes Festival is a unique festival in Europe at the end of March. Concerts staged in the wildest settings in the heart of the ski area, so put your skis on and join us throughout the Portes du Soleil’s slopes. Portes du Soleil offer a ride in mountains between 1000 and 2450 m, in France and in Switzerland, where you can discover the fabulous Mountain Bike area of the Portes du Soleil and its landscapes. – What can the resort offer as aprÈs-ski after exhausting skiing day? Thanks to Sports center «Palladium» there are many possibilities of activities for all the family: ice skating rings, curling area, indoor swimming pool and Thermal Center. There are regular concerts in public pubs. You can spend the every weekend evening in an igloo – beautiful igloo located in Grand Paradis, which is opened for having a nice evening with friends. Special nights are guaranteed! The Yurt of Grand-Paradis (Raclette party) is an original after-skiing party in a Yurt, which is waiting for you at the end of the last slope of your day. Join to us! – How do your guests can get there the best? The best way to get here is from Geneva International airport, the transfer takes 1 hour 30 minutes by car and it will take 2 hours 30 minutes by train.